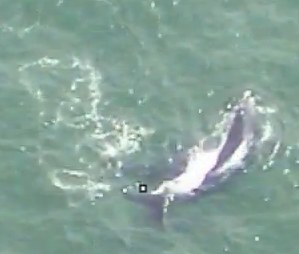 We recently received some good video footage of right whales off Cape Cod, taken April 22 by Aerial Surveillance, Security and Intelligence Systems Technologies-U.S., LLC (ASSIST- U.S.). Although it's only a few minutes long, in that short time we get to see a few different behaviors, starting out with surface active group (or SAG) involving three whales. As the camera zooms in, there is alot of white water and you may catch a glimpse of a flipper or half fluke as the whales roll around one another. Then, two of the whales split off from the third (who appears to pursue them briefly, then dives deeper and disappears). As the camera readjusts to focus on the pair, we see that, in fact, it's a mother and her calf! From this perspective you can see the bright white callosities on the mother's head (allowing us to identify her as possibly Catalog #3430), and we can also see that she is subsurface feeding--the greenish area just below those callosities is her wide-open mouth (the inside of a right whale mouth is actually whitish, but the water color makes it look light green). Meanwhile, her 4-month-old calf swims above her. The mother makes a sharp, hairpin turn (indicating that she's reached the edge of the zooplankton patch on which she was feeding) while closing her mouth and surfacing for a breath. 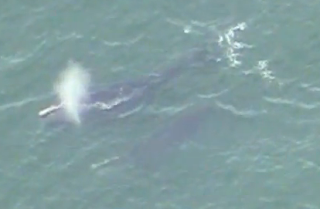 Just as the mother/calf pair submerge again, the image dissolves into a different pair of right whales. These two whales are subsurface feeding in "echelon," where one whale is in the lead and the other is to the side and just slightly behind. We're not sure why right whales sometimes feed in echelon, but we suspect there is a benefit to being a "wing-whale." Perhaps the copepods sense the lead whale's approach and jump out of the way (and right into the path of the whale to the side). Or perhaps the lead whale's turbulence concentrates the copepods in between the two whales. Whatever the explanation, right whales know how to get the most from a zooplankton patch, and echelon feeding is just one of they ways to do it. The last shot is of a diving whale, it's tail with white fluke tips lifted into the air. Thanks to ASSIST-U.S. for sharing this birds-eye view of right whales!